The Tascam 122 mkII is the legendary master cassette tape recorder offered by Tascam for professional audio use. As if it wasn't god enough on its own, we had ours completely refurbished and extensively modified by Alex Nikitin of ANT Audio in England. Apart from making sure, everything runs perfect, he also replaced plenty of the electronic components originally used by Tascam with much higher quality devices including some of his own custom IC's. This is a significant improvement compared to the original with a machine now truly being a mastering-grade recorder. Anyone thinking that cassette tape does not offer the high fidelity sound required for audio mastering has clearly never used one of these decks. It comes with dolby B and C, MPX filter as well as easy to access trimmers for calibration. 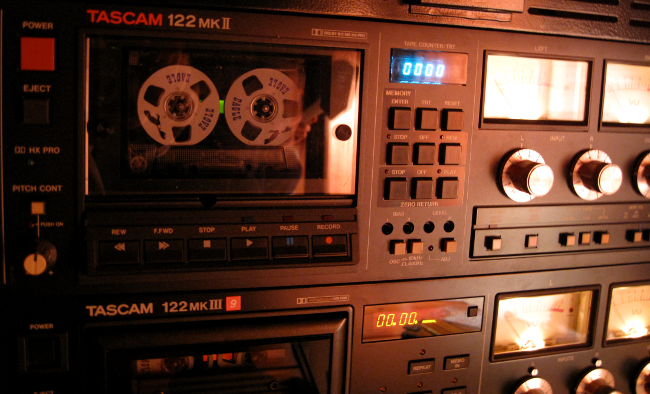 It can work with all types of tape and we use it regularly, not only transferring material from existing cassette tape recordings, but also to create new ones. This deck is flat from 30 Hz to 20 kHz in record mode and can play back 30 Hz to 25 kHz flat, with very low distortion unless driven hard.